Aching feet, tired back, sunburn, possibly a slightly questionable state of personal hygiene and a body longing for some of the comforts that are promised with the return to the urban environment. Hiking and camping weekends are always best ended with a hot shower, cold beer, and something soft and comfortable to lie down on, but thinking about how to clean a Camelbak is usually quite far down on that priority list. The last thing anyone feels like doing is figuring out how to clean water bladder, especially amid the mountains of laundry and bags to unpack. However, knowing how to clean hydration bladder is essential to ensuring that it can serve you well and for a decent time into the future. Read our useful information on how to select the best running hydration pack for more details. Once a hydration pack has been left to accumulate mold and a menagerie of microscopic universes, drinking from it may forever feel dirty and unpleasant, even after it has been thoroughly cleaned. Cleaning your Camelbak does not have to be too tiresome at all. Even if you did give it a decent clean previously, but you found that taking a sip from it gave your water a hint of something else a bit less pleasant, then refining the technique and cleaning method you used may be highly advisable. A simple rinse may suffice at times, but a deep clean is definitely a necessity once in a while. There are a number of shortcuts and easy methods that will make the cleaning process fast, easy and highly effective. This will be paramount to easy packing for the next use, as it will already by hygienic and ready to use. There are some great cleaning kits available, but these are not a necessity at all, and there are also some easy and inexpensive ways to clean a camelback at home by using nothing but some common household items. Knowing how to correctly clean your camelback will also prevent unnecessary trauma or damage to it. The start of any great recipe or instruction includes a list of what you will need. We will look at what items you can use that are probably in your home already, as well as pulling apart a few cleaning kits, which can be purchased from most outdoor apparel stores, or online from sellers such as Amazon. Thereafter, we will examine each step involved in getting your hydration pack clean, dry, and ready for storage until its next use. The next time you use your hydration back, the bladder will hold the water and provide you with crystal clear, clean hydrating fluid. The lemon or lime juice tends to be a better option to use if you need to clean the bladder of your Camelbak while you are out in the field, as a temporary quick fix to stop bacteria or mold from growing. Lemons and limes are convenient to transport, as they do not bruise or get damaged easily, and can easily be cut in half in order to access the acidic juices inside the fruit. These juices can also be diluted with water at a 1:10 part ratio before use. Many hikers also find the taste of lemon in their water very pleasant, and may actually choose to keep a lemon in the drinking water during hikes too. White wine vinegar and bleach are both great options but should be diluted in water before use. It can be diluted at a 1:10 ratio in the water. Bleach is more harmful to the human body than vinegar is, so vinegar should be your first option. Bleach can be used safely, but care must be taken to ensure that it is washed out very thoroughly before the camelback or hydration pack is used again. Vinegar has a very strong smell, and therefore it is important to rinse everything thoroughly to ensure that the vinegar smell will not taint the flavor of drinking water that is kept in the hydration pack after it has been washed with vinegar. An alternative to the options listed above for killing and mold or bacteria when you are cleaning your hydration pack, is to buy specialized cleaning products online. One of these options is cleaning tablets. Cleaning tablets work in 5 minutes and should be prepared by adding 1 tablets to 1 liter of warm water. These tablets are designed to lift and remove and residue that will cause an undesired taste or odor in the water. There are quite a few cleaning kits available on the market that are specifically designed to make the cleaning process of a hydration bladder much easier. 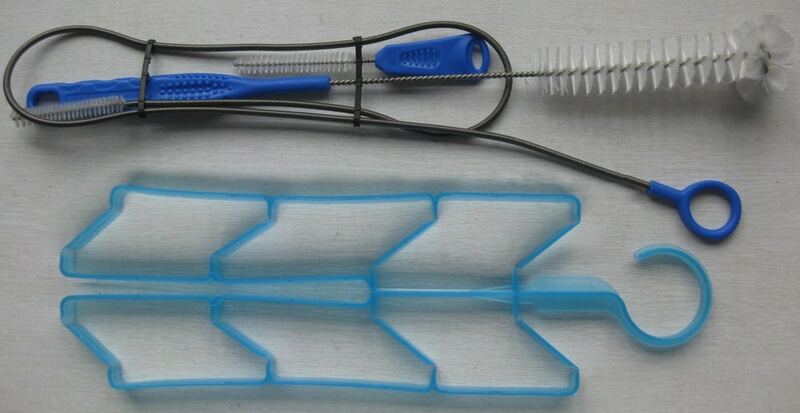 They are generally equipped with items like a brush, hooks and cleaning tablets. The Camelbak Antidote Cleaning Kit (which is available on Amazon) is a great example of an aftermarket cleaning kit which contains all the necessary components to clean out your camelback with. The tablets that are contained in the kit can be replaced or restocked, or they can be substituted with one of the abovementioned home ingredients, such as white wine vinegar, bleach or the juice from a lime or a lemon, once you run out of tablets. The cleaning kit also contains hooks and other utensils that are designed for various shaped bladders, and it is important to make sure that the tools you are using are safe and compatible with the bladder your hydration pack has. Now that we know what we need to clean a Camelbak, let’s examine the practical elements, step by step, to get a squeaky and hygienically clean product. Care should be taken with brushes to ensure that they do not damage or perforate the lining of the hydration pack. A leaky bladder will not contain very much water! Hooks and snaps should also never forced if you are using hooks that are not specifically geared at your hydration pack, use them gently to prevent anything from damaged. A hydration pack should be left to dry after each use, but a deep clean using the materials listed above will only be necessary after 3 or 4 uses, or if you plan to store the pack for a long time and you do not expect to use it again soon. If you wish to do a quick clean in order to have your camelback usable again soon, then follow the first steps of the instructions only. If you wish to give your hydration pack a deep clean, the instructions through to the last step will guide you on how to safely use the materials we have discussed to keep your hydration pack and in optimum condition for its next use. If you have any water or other fluid contained in your hydration pack, drain the bladder as thoroughly as you can to get it empty. This should be done by holding the bladder in an elevated position above the hose and allowing the contents to run out through the hose by pinching the bite valve. If you are doing a quick clean, you can hang it your hydration pack up to air out as step number four indicates in detail. For a deep clean, continue to step two. At this point, it is advised to use one of the cleaning products we have discussed, such as white wine vinegar diluted with water, bleach diluted in water, lemon/lime juice diluted in water or the cleaning tablets provided in the cleaning kit. Fill the bladder with your choice of cleaning product, close it, shake it, and leave the solution inside for the recommended time frame. Before soaking it, many people prefer to give it a gentle scrub along the insides with the brush in the kit. This should be done with utmost gentleness and care to prevent any parts of the brush from hooking, damaging or puncturing the inside of the camelback or hydration pack. For the cleaning tablets, it is recommended to leave the solution in as per the instructions on their packaging. This is usually 5 minutes. For the home remedies, the solution can be left inside for up to 30 minutes. Step 3: Void Your Bladder! Release the cleaning product contents held inside the reservoir of your hydration pack. Ensure that you have removed as much of the liquid as possible. It is highly recommended to rinse the reservoir out again, especially if you used bleach, as this is best not consumed and any residues that remain may contaminate your water in the next use. Ensure that the solution also reaches the inside of the hose. Also adequately flush and rinse the hose. This can be done a few times to ensure that the hose is perfectly clean and no cleaning residues will remain. At this point, you will need to suspend the hydration pack in a way that is going to promote maximum air flow inside and outside of the device. The cleaning kit will provide hooks that can be snapped onto the hydration pack and hang in an open fashion. It is very important to ensure that the sides of the reservoir do not touch each other for this step, as touching sides will harbour water and moisture. The drying technique is very important in ensuring that bacteria and mold do not adhere to the surface of the reservoir inside. Once the hydration pack and all of its components are thoroughly dry, it is recommended to it, by tasting the water to ensure that it is clean and free from any strange flavour or odors. If you feel it may need another clean, a second round identical to this first one can be repeated, until the camelback passes the taste test. It is best to perform the taste test with water, rather than juice or any fluid, for the obvious reasons of clearly being able to taste whether the contents in the camelback are being stored in a clean vessel. Once your hydration pack is satisfactorily clean and dry, and you do not have any intentions of using it again soon, it highly recommended to store it, neatly folded with its components, in the freezer. Bacteria and other microbial life cannot flourish or even survive in such cold temperatures, which is also why perishable foods are stored in the freezer. Your hydration pack will stay clean and intact safely and away from germs and bacteria until you are ready for its next use. These devices only require deep cleaning efforts every few months, provided they are always drained and dried immediately after use. If anything other than water was contained inside the reservoir, it will be necessary to deep clean after every use. Knowing how to clean hydration bladder will not only extend its life, and prevent discoloring but will also prevent the growth of bacteria, mold and mildew inside it. Considering the importance of having clean, easily accessible water on future outdoor adventures, taking this time to give your camelback the attention it needs, will create a far better relationship between the device and your water in the future. Trying to clean water out of a camelback that has been standing for a few days will not only be a far more unpleasant experience but even once the camelback is totally clean, you may continue to feel as though the device is tarnished for life. Happy hiking and happy hydrating to our readers! For tips on how to choose the top hydration bladder, check out our earlier piece to find out more. Have you cleaned your hydration pack in a more efficient way, or do you have an interesting story about your camelback? Share your experiences with us, we’d love to hear from you!